Having lunch with Dave this week was a favourite. We sat on the patio for beer and wings, and stayed dry during the rain storms that passed through. Q napped for most of lunch. Playing with E and Q was a favourite. E built up these blocks and then Q knocked them down. It was the last day of school yesterday. E has grown so much and had a great report card citing many improvements over the year. Bring on Grade 1! It's Canada's 150th Birthday this weekend. In 2015 I wrote about my favourite things about Canada here. They are all still accurate. 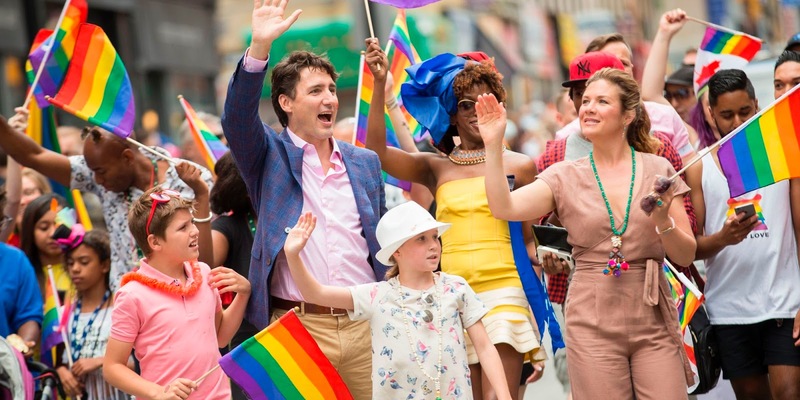 Another favourite thing this week was Justin Trudeau at Toronto's Pride Parade. Not only was he there with his family celebrating the LGBT community in French and English, he was also wearing rainbow socks wishing Muslims Happy Eid in Arabic, he was at peak Justin Trudeau status. Peter Mansbridge, host of CBC's The National, is retiring. The Canada Day broadcast will be his last show and then a new National will premiere in the fall. I watched the staff party they had for him at the CBC earlier this week. I loved the montage of old footage and commentary from his colleagues and friends. I couldn't find the clip of the party (I originally found in YouTube via Twitter), but here is a good clip of Peter answering a question about whether the CBC has a Liberal bias, watch to the end for a personal side of Peter.